"Our audience was delighted with your performance and the opportunity to learn more about Ben Franklin and our country's history." Chautauqua is a "presentational" educational tradition that has been enjoyed by audiences for more than 100 years. Started in 1878 at Lake Chautauqua in New York, Chautauqua uses performers, dressed in character, to "present" a variety of topics or personalities and bring them to life. Combining popular education with entertainment, traditionally, Chautauqua topics ranged from history to literature to political presentations. By 1891, Chautauqua was hailed as "...the greatest popular educational movement of modern times," and President Teddy Roosevelt claimed, "The Chautauqua is the most American thing in America." By the turn of the last century, more than 35 million Americans a year attended Chautauqua. Such a high number of attendance confirms its importance and value among the American public. The audience appreciation of Chautauqua simply keeps people coming back. 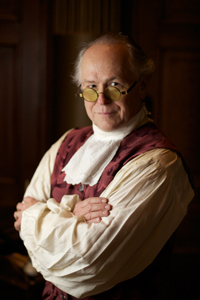 Today, GregRobin Smith as Benjamin Franklin, Original American, brings the Chautauqua tradition alive for children and adults in the finest tradition of presentational history and education. For an article on the forming of the Chautauqua movement, may we suggest copying the following address into your browser.